Are you looking for a new HOA manager? Or just a quote to price compare for due dilligence? Electronic Architectural Applications, Proxy & Nomination Forms plus Clubhouse Rental Requests – No More Paper Forms! No surpirse extra fees for postage or meeting attendance! 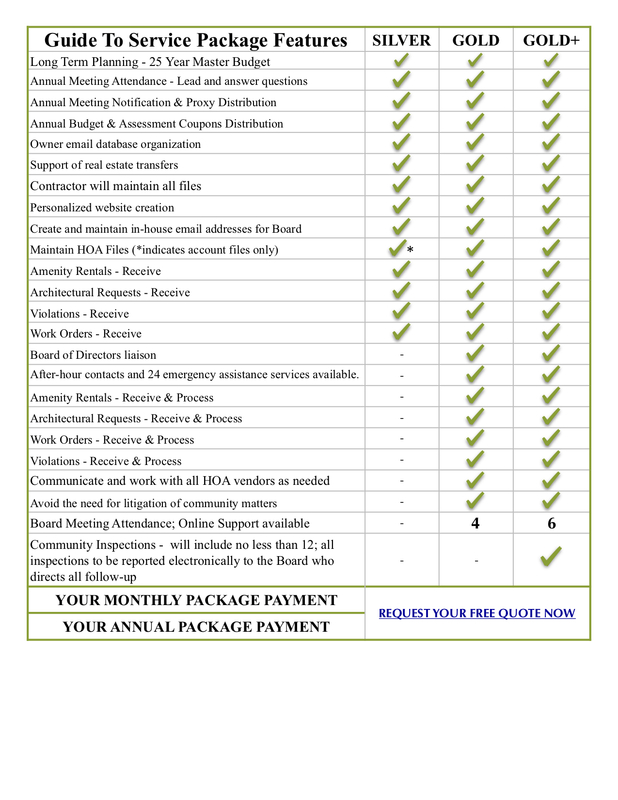 Please review our package options below and fill out the request form to receive your free quote! We are always accepting new clients – no matter the size! All of the services listed below are carefully designed to help achieve unity and success for every member. There will never be hidden fees for any of our services unless explicitly specified and approved with the Board. The following lists the services provided by Grandchester Meadows, Inc. as a part of our SILVER Package. Owner email database organization for unlimited email broadcast notices and general announcements. Support of real estate transfers which is designed to help facilitate an on-time closing. We will respond to inquiries from all potential new buyers, lenders, attorneys and/or real estate professionals in a timely manner. System to help receive and/or generate HOA files including: meeting minutes, owner roster database and correspondences, work orders with invoices, infractions and other general HOA business files. Grandchester Meadows, Inc. plans and acts appropriately to avoid the need for litigation. Long term financial planning with a 25 year Master Budget Plan that details future expenditures and the anticipated annual assessments required to meet those expenditures – guidance to avoid special assessments. The assessments will be collected and deposited upon receipt. Quarterly statements and payment reminders sent to all owners. Delinquent accounts incur late fees as needed. All legal action approved by Board. All accounts payable will be processed within 15 days of receipt from vendor. Monthly financial reports are posted online each month for member viewing plus emailed directly to Board. Attendance at Annual Meeting to lead the meeting and answer questions. Preparation, distribution and postage of one (1) Annual Meeting notification and proxy, plus one (1) Annual Budget and Assessment Coupon notification to membership is included in all service contracts. Personalized website creation, hosting, and maintenance at no additional charge. Our website allows the HOA to improve community awareness plus provides more efficient distribution of information for all members. Includes our meeting minutes generator. There is also a website section devoted to helping home owners learn more about the NC State Laws that govern many of the HOA functions. This is important for home owners and Board members since many are not aware of how the State defines how the HOA will govern and make decisions. The following lists the services provided by Grandchester Meadows, Inc. as a part of our Gold Package. Maintain system to receive, generate and/or process most HOA files: meeting minutes, owner database and correspondences, work orders with invoices, and other general HOA business files. Board of Directors liaison to membership, municipality agents, and vendors. After-hour contacts and 24 emergency assistance services available. Distribution and postage fees for two (2) newsletters. Annual Meeting Attendance to lead the meeting and answer questions. Preparation, distribution and postage of one (1) Annual Meeting notification and proxy, plus one (1) Annual Budget and Assessment Coupon notification to membership is included in all service contracts. Attendance and preparation assistance of on-site Board meetings. Create and maintain in-house email addresses for Board members. Ex. sampleBOD@grandchestermeadows.com. The following lists the services provided by Grandchester Meadows, Inc. as a part of all Gold+ Package. Maintain system to receive, generate and/or process HOA files: meeting minutes, owner database and correspondences, work orders with invoices, and other general HOA business files. Maintain system to receive, generate and process potential violation infractions and/or concern reports. Inspection reports of potential violations are sent to Board electronically once per month. Distribution and postage fees for four (4) newsletters. Attendance and preparation assistance of up to six (6) on-site Board meetings. NOTICE OF RIGHT TO VOLUNTARY MEDIATION – Pursuant to Section 7A-38.3F of the North Carolina General Statutes, all members are hereby informed that you have a right to initiate mediation pursuant to the terms of the statute to try to resolve a dispute with the Association. Both the homeowner and the Association must agree to mediate the dispute, and each side is responsible for splitting the cost of the mediation, including payment of a professional mediator. The mediation process is an opportunity to reach an agreement to resolve a dispute – neither side gives up their right to go to court to have a judge resolve the dispute if the parties are not able to reach an agreement through mediation. The specific process to initiate voluntary mediation is outlined in Section 7A-38.3F of the North Carolina General Statutes. Disputes regarding HOA assessments or deliquent accounts are not covered in this Statute.